Patricia Hynes, speaking at the 2015 International Symposium for Personal and Commercial Spaceflight, of which she is cofounder and chair. In a recent interview with Space.com, Hynes emphasized the value of getting college students involved in spaceflight. The International Symposium on Private and Commercial Spaceflight is an annual meeting for the industry's top leaders and innovators, but according to the meeting's co-founder, Patricia Hynes, its central purpose is to get student projects off the ground. Only a few hundred people typically attend the ISPCS, but those attendees are often big hitters in the industry: Speakers at the two-day conference usually include executives from the world's top spaceflight companies, including Orbital ATK, SpaceX, Virgin Galactic, XCOR and Sierra Nevada Corp, among others. Hynes is the director of the New Mexico Space Grant Consortium (NMSGC) and the New Mexico director of NASA's Experimental Program to Stimulate Competitive Research (EPSCoR), both of which provide funding to grow the aerospace capabilities in that region, primarily through student education. This is only a snippet of Hynes' résumé, though: She is involved in about half a dozen aerospace-related endeavors at any given time, most of which are focused on taking stock of the state of the industry, looking at where it's headed, and helping it grow. "In the '90s we talked about the need to tell students about this part of the industry that Bill was working on," Hynes said. "As we met at conferences we talked about the need to create more of a focus on what is coming next in the space industry and how could we get students to be interested in this when they were studying in college." ISPCS was created to be part of the X-Prize Cup, an exhibition of cutting-edge air and space vehicles first held in 2005 in Las Cruces, New Mexico. "Bill and I both agreed that the X-Prize Cup would be a good event for us to attach this symposium to, where we would discuss this whole new approach to launch vehicles and human spaceflight, and get people more engaged in our industry. So that's how it started." Hynes said her vision for the symposium has changed in the last decade, as both private and commercial spaceflight have grown rapidly. In addition, next year's ISPCS theme is "We will not stop." This is in reference to the industry's perseverance in the face of three serious setbacks that have occurred in the last year. In October 2014, an Orbital Sciences (now Orbital ATK) Antares rocket exploded seconds after liftoff, and Virgin Galactic's SpaceShipTwo broke apart during a test flight, leaving one pilot dead. Last June, a SpaceX Falcon 9 rocket also exploded shortly after liftoff. "This industry will not stop," Hynes said. "It is going, and it will grow. And so now my thinking is, What's going on in the future? What are those things that we need to bring to the awareness of the public?" Patricia Hynes, speaking at the 2007 International Symposium for Personal and Commercial Spaceflight, of which she is cofounder and chair. 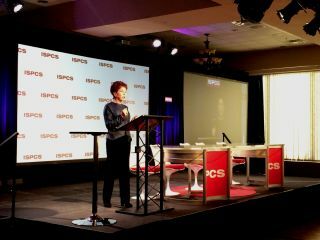 The primary way in which ISPCS is connecting with the public, Hynes said, is by supporting students. "ISPCS proceeds are used to send student experiments to space. We've sent 73 [experiments] to space with support from NASA, mostly through [NMSGC]. I use the funds to supplement the money I get from NASA to run the space grant program and the NASA EBSCoR program, to get more [college] students involved in this industry." Hynes says many students will work on experiments intended to fly into space, but which never actually make it off the ground. And this, she said, is a big problem. "It's like saying 'I'm going to learn to ride a bike but I don't own a bike.' That's going to be some bike-riding career!" she said with a laugh, before switching to a more serious tone. "It's a waste of time, and its dishonest to get kids involved in space experiments and never give them an opportunity to see how they actually get this thing into space, and to find out if it really works, and does it tell us anything? When my students build we have in mind what's the launch vehicle that you're going on, and what's our mission? We are very focused on having students be able to say, 'By the time I was a junior, I had sent these three sensors into space on this vehicle, and here's the data that we got and here's what we learned.' There's a difference in what kind of job that kid's going to get, and the kid who said, 'Yeah, I was on a team and we worked on it and we never flew it.' That's a waste of money, it's a waste of time, and it's a waste of opportunity. You gotta get 'em to fly."